In 1968 Jeno Paulucci, the creator of the Chun King line of pre-packaged Chinese food, took an egg roll wrapper and stuffed it with pizza toppings. America has had terrible heartburn ever since. Jeno's Pizza Rolls, now Totino's Pizza Rolls, have become a staple of snack cuisine around the world, the poster snack for putting things into other things they wouldn't normally go into. The question is should you be putting these things into your mouth hole? No review of Totino's pizza rolls can properly commence without giving Jeno Paulucci his due. The late entrepreneur was a champion of both freezing and microwaving things, a pioneer in getting food to our mouths faster and cheaper than ever before. Along with the pizza rolls and Chun King, Jeno was also the man behind Michelina's brand frozen dinners, available now for a buck a pop in your local grocer's freezer. I have eaten so many of these — hell, I had one for breakfast this morning. He named the brand after his mother; I can imagine no greater tribute than having your name so close to the 10/$10 tags in a Walmart freezer. 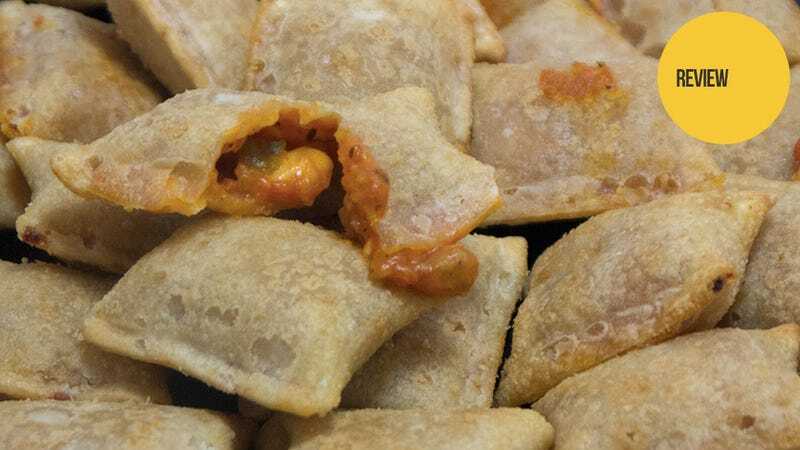 In 1985, Paulucci sold his Jeno's Pizza Rolls brand to Pillsbury Corporation for $135 million, and Pillsbury renamed them Totino's Pizza Rolls, making them a part of the company's line of horrible frozen pizza. This was a horrible move. As of this writing Pizza Rolls are still incredibly popular. To large swaths of this country, they qualify as hors d'oeuvres. Paulucci died last year an incredibly rich man, but what's the use in piles of cash if you don't have pizza rolls? The key feature of the Totino's Pizza Roll is the eggroll shell. Light and crispy on the outside, chewy on the inside, It makes for a fine edible container for anything that might lurk within, though only if you cook the pizza rolls in one of two ways. If you bake them in the oven, they are fine. If you fry them in oil, they are also fine, though you don't need to get any less healthy than you already are. Never cook Totino's Pizza Rolls in a microwave. Paulucci's ghost might approve, but then he doesn't have to bite through the gummy hardness these shells become when subjected to microwave radiation. They are edible, but only in the loosest definition of the word. That, and if you arrange more than the suggested six pieces on a plate, you could microwave these for hours and one would still be ice cold. Inside a Totino's Pizza Roll you'll find what looks like pizza toppings that have been through a horrible transporter accident. There is tomato sauce here, though tomato sauce with the bitter aftertaste that comes of someone dumping the entire jar of "Italian Seasoning" into a vat of tomato pulp. Chunks of brownish-gray sausage and bright red pepperoni squares mingle with a magical sort of mozzarella that defies any attempt to make it melt. I'm betting it's an advanced cheese hybrid that, when subjected to intense heat, instantly transitions from solid to gaseous form, with no near-liquid state in between. It cuts a striking figure on the plate, to be sure. Whether alone or in a group, the Totino's Pizza Roll looks like something you should put in your mouth. That is its greatest success. The look has to be its greatest success, because it's not winning any prizes for neatness or safety. When you place molten tomato and cheese food product into a flimsy baked shell, accidents like this are bound to happen. Just look at the baking sheet you're left with after you've transferred the rolls onto a plate; it looks like a battlefield after the corpses have been dragged away — piles of ejected viscera as far as the eye can see. These eruptions can also happen when biting into one of the bite-sized Hot Pockets. Ideally one pops a snack unit into their mouth after a lengthy cooling period (I give mine at least a month and a half) and they burst open with a single bite, a cyst of Italian-ish flavor exploding in your mouth. Without that cooling period, however, the Totino's Pizza Roll is a dangerous weapon. The insulated nature of the wrap hides the true temperature of the molten mixture within. Having your mouth flooded with third-degree burns is not a good way to die. For one, it can't kill you. You'd think that was good, but then you spend a week getting torn bits of your own inner cheeks stuck between your teeth. Or maybe the innards will burst outside of your mouth, coating your lips and chin with burning pain. Just let the damn pizza rolls cool first, people. It's really only the first two or three rolls you need to worry about anyway. They you'll get bored with them and start pulling them apart as a means to keep yourself entertained. This always happens. I'm not a big fan myself. I've spent the better part of the year avoiding things that make the bile rise up in my throat, and here I am, burping up tomato basil-flavored stomach acid. So that's a strike. The second strike is that the stomach acid cocktail doesn't taste much different than the rolls did going down. I still get that bitter seasoning taste. The tomato "sauce" hasn't changed much. If I'm incredibly lucky those tiny bits of meat, barely big enough to bite, come back up for another run through the tooth gauntlet. As pleasant as it is to revisit a meal so completely, I am of the belief that food should undergo some sort of major transformation once it's been subjected to your internal mechanism. These Combination Totino's Pizza Rolls did not, so either they taste like heartburn to begin with, or taste so strong that the stomach acid, it does nothing. I don't like eating food that makes me question the potency of my stomach acid. I think that's all I really need to say here.